I hope you’ll forgive me for returning to the subject of Jamaica one last time, but I have the exciting news to share that the last chapter in this nearly year-long odyssey is finally complete: our article is now out! Yes, after we returned from Jamaica, Food and Travel Magazine accepted our write-up and pictures for publication and molded them into a story for one of their Gourmet Traveller features. And just this morning the issue containing that article came tumbling through our mail slot bringing to an end months of nearly unbearable anticipation. So, dear readers, if you happen to live anywhere where this London-based magazine is sold, you can now pick up a copy of the November issue, turn to page 73, and see what our joint effort looks like in glossy A4 print. If you live in the U.S. there’s a good chance your local Barnes and Noble or Borders carries F&T (though they might be lagging behind an issue or two). p.p.s. F&T also generously ran a mention of this website, so if you’ve found your way here through the magazine, welcome! CONGRATS!!!!!!!!!!!!!!!!!!!!!!!!!!!!!!!!!!!!!!!!!!!!! !Like any of us would ever fault you for returning to the Jamaica feature? HECK NO!I’m so completely proud and thrilled for you. I can’t think of a more deserving writer. Indeed! Many heartfelt congratulations. Keep up the good work. Congratulations on your article, Melissa! It was wonderful reading about Jamaica in your posts, so great the rest of the world is now in on it too! Bravo Melissa! So well deserved! I cannot wait to get the magazine! This is so exciting! I can’t wait to read it. I hope they did you justice. Awesome! Congrats, particularly on the cover mention! Can’t wait till it comes out here (I was just at B&N, and they still have a previous issue out on the shelves). Yes! I have it here. Congratulations, it looks even better in print. Bravo Melissa! We all knew you can write and you can take pictures, but your work in F&T is just lovely. I can imagine holding your work in print is a great feeling. Congratulations! Congrats! I will run to B&N this week to pick up a copy! I am thrilled for you. Amazing pictures! I can’t wait to get my issue on F&T and read your article.Congrats Melissa, you MUST be feeling on top of the world! Congratulations indeed! I will try my best to find it out here in Los Angeles. Looks like you two had a very fine vacation. Yaaaaay! Congratulations, dear Melissa! I’m going to pound the pavement until I find a copy in Seattle… xo! Congratulations Melissa, I knew your blog was special! Congrats, Melissa! F & T is my favourite magazine. You really deserve the glossy feature, and much much more 🙂 Please do not ever stop writing. Bravissimi! Wonderful! I’ll try to get a copy!Congratulazioni! Congratulations! You have one of the best food blogs out there, with wonderfully evocative writing and gorgeous photography. I’m sure you’ll be landing more pieces in major publications in no time. Melissa, great site! the photography for your article is stunning — does Manuel take the photos for this site, too, or are you also a photographer? Congrats on the publication! Congratulations, my dear, it must be exciting to have copy in your hands at last. I will track one down here in San Francisco, so I can see you in all your glossy glory. Congratulations also to Manuel, the photos are gorgeous. What a talented couple you are! hi melissa, congratulations! finally……i think traveler’s lunchbox devotees have been anticipating this day as eagerly as you and manuel have – has it been worth the wait? 110% yes! Melissa,Congratulations! I’ve read the article and I think its a wonderful piece. It makes me want to go back to Jamaica (it’s just too far from here). The photos, taken by Manuel, are beautiful. Melissa,That’s wonderful! I can’t wait for the magazine to hit Toronto! Got to get a copy. Congrats! hi melissa, again, congratulations, i can’t wait to get my hands on a copy when i go to the bookstore tomorrow! i am sure it’ll be nothing short of marvellous! Hi Melissa, I was absent from the English side of the blog world for a while.Congratulations on the article. 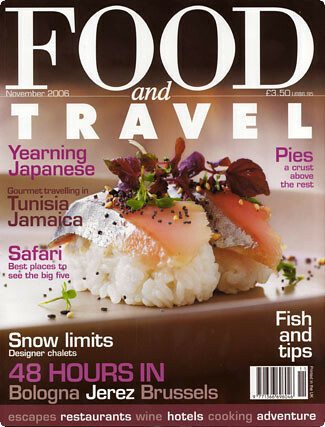 I just happened to see this issue of F & T at the newsagents in Canary Wharf where I work. I shall pick it up tomorrow and have a read and look at the article.If this site is anything to go by I am sure that it will be fabulous. Hi Melissa. Congratulations! Will go straight out and buy it (as if I ever miss one, anyway…) I think you have definitely just realised one of my secret dreams, so it’s good to know that it’s possible. Well done! Oh, this is soooo cool! I stopped by B and N to check it out.For some reason, and entirely without justification, I feel proud.Good for you, Melissa!